, and now we're moving on to what to do. 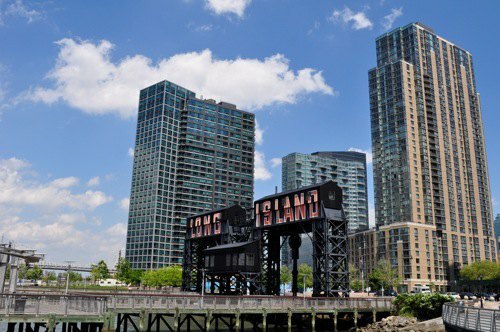 Here is our list of worthwhile things to do in LIC, from museums, to parks, to recreation. This 19th century schoolhouse holds some of the most current art available in NYC; it is one of the oldest (and largest) nonprofit contemporary art institutions in the US, founded in 1971. Various kinds of new and experimental art in all media are displayed throughout the space, and MOMA PS1 considers itself more of an exhibition space, rather than a "collecting institution." As indicated by its name, PS1 is affiliated with the Museum of Modern Art. Each summer, PS1 launches their weekly "Warm Up," a music (often DJs) and dance extravaganza held in the courtyard of the museum, surrounded by the winner of the "Young Architects Program,” usually in the form of a large scale art piece that consumes the place. Inside is the newly opened M. Wells Dinette, the creation of Sarah Obraitis and Hugue Dufour of M. Wells Diner fame, and probably the best place in the borough for sous vide prepared food and other culinary delights. Admission: $10 adults; $5 students and senior citizens; free for MoMA members, MoMA Corporate Members, MoMA admission ticket holders, Long Island City Residents, NYC public school students, Members of the Press, and other Museum Staff with valid ID. This museum is devoted entirely to the works of the acclaimed sculptor and artist, Isamu Noguchi. The space has a solid, industrial feel to it, as it originally was a former printmaking plant and gas station. Noguchi's work with stone is what many expect to see here, but there are also drawings, designs, and works with metal. Docent-led tours are available, and on Wednesday through Sunday, Japanese language tours are available (call to reserve). The museum also produces various public programs, including First Fridays (in the Summer and Fall, admission is pay-what-you-wish, there's a cash bar, and the museum is open late), Second Sundays (dialogues with experts), and a variety of live music performance, from jazz to world music. The museum also has a gift shop where books, jewelry and mid-century furniture can be purchased, and there is tiny café there, too. Continuing with the theme of museums existing in former industrial spaces, this exhibition space - redesigned by artist and designer Maya Lin (she may be most well known for her Vietnam War Memorial) - is housed in a former trolley repair shop, and has been there since 2001. The SculptureCenter was originally founded in 1928, and is "a not-for-profit arts institution dedicated to experimental and innovative developments in contemporary sculpture. [They] commission new work and present exhibits by emerging and established, national and international artists." The Center's interior space is 6,000 square feet, and they also have a 3,000 square foot outdoor exhibition space. Exhibitions and events happen throughout the year. Admission: $5 suggested donation, $3 for students. This arts non-profit is "dedicated to promoting contemporary visual arts to a broad public audience." They strive to help the public understand and appreciate contemporary art through dialogue. This is a special place for curators, too, as they are given the opportunity to highlight artists they deem important in the world's contemporary art scene. By visiting, you'll not only get a taste of contemporary art, you'll also have the chance to understand how the curator came to choose the particular pieces in front of you, as well as read their thoughts about the works in the illustrated brochure provided by the Gallery. Housed in a former parachute harness factory, this private foundation is home to the contemporary art collection of Emily Fisher Landau. She is a philanthropist who, starting in the early 1960s, purchased may of the pieces in the collection from artists early in their careers - some of those artists include Andy Warhol, Cy Twombly, and Robert Rauschenberg. The museum itself was designed by Max Gordon (designer of the Saatchi Collection in London) with Bill Katz, who is the curator of the collection. The mid-century furniture in the Center is designed by Warren McArthur. The exhibition space takes up three floors, and on each floor you'll find a staff member happy to help guide you through the immediate collection. This non-profit arts center "supports and promotes emerging artists through exhibitions, commissions, residencies, and collaborative opportunities." It serves as an "incubation and laboratory space for the creation of artworks" and collaboration is an important part of that process. Flux Factory runs a residency program for artists, produces major exhibits a year, as well as numerous smaller ones yearly, including open studios. They have also produced a number of classes and workshops that anyone can take, as well as monthly salons, lectures, film-screenings, and receptions for visitors to the center. This Obie Award-winning theater, dedicated to helping realize new works for multi-disciplinary theater, is housed in a 5,000 square foot, two-story renovated commercial garage. It supports artists and creative professionals with a residency program, free workspace for curated visiting artists, and produces 20-30 shows a year. The origins of The Chocolate Factory lie with the members of theater et al (1999-2004), who were in search for affordable space and the luxury of time, as well as the proper technology needed to push the envelope in the concept of live performance. Seeing a show at The Chocolate Factory might include dance, spoken word, video, and beyond. 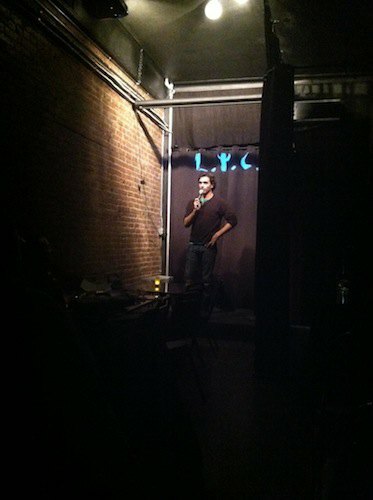 Known for a long time as the home to tasty California-style Mexican food in LIC, the Creek and the Cave has worked to gain a reputation for excellent live comedy shows. They've gotten so good at putting on these shows that Time Out New York rated them as one of top comedy venues in the city, along with the likes of Upright Citizens Brigade Theatre and Magnet Theater. Comedian Colin Quinn has performed there a number of times, and in September 2012, comedian Jerry Seinfeld treated the audience with an introduction to Quinn's performance. Stay for the food, too - the fish tacos (breaded, please) in particular are excellent, and the margaritas come in pint sizes. Known as LPAC, this performance space at LaGuardia Community College aims to present high-quality programming that reflects the diversity in the local community and the world. Here, you'll see internationally acclaimed music, theater, and dance pieces, by artists such as the acclaimed Ballet Hispanico. LPAC has become a performing arts destination in LIC. This small club has hosted some great comics in the short time they've been open, including Ted Alexandro, Judah Friedlander, Michael Somerville, Rich Voss, and club owner and comedian Steve Hofstetter. Shows run Wednesdays through Sundays with multiple comics each night. Wednesday at 6pm is usually reserved for open mic, too. Along with your comedy, you can order food - such a Tots of the Damned, pulled pork tacos, and chocolate bourbon pecan pie - and drink - draught beer and signature cocktails, mostly named after famous comedians like George Carlin and Richard Pryor (shows have a 2 drink minimum along with the cover charge of between $5 and $20). 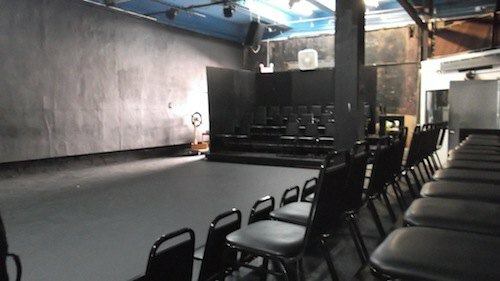 This theater space - established in 2005 by Richard Mazda as an an off off Broadway theater - is located in The Long Island City Art Center, and is home to The Queens Players, a local non-union company that presents both new works and classic theater works. 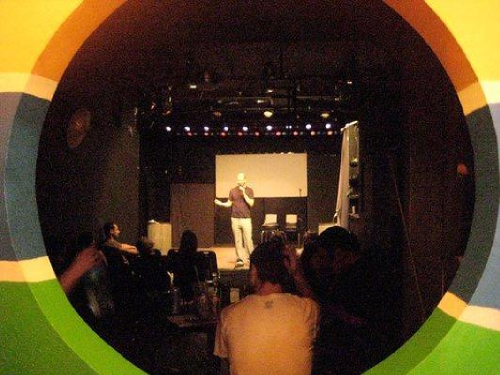 The Secret Theater has also been the location for a variety of performing arts, including dance, music, and plays, as well as classes, art openings, parties, films (including the most recent Astoria/LIC International Film Festival), and more. Performances are Thursdays through Sundays. Learn the potter's craft at this art education center that offers ceramics classics throughout the year at levels from beginner to advanced. In their words, this place is "a sanctuary in NYC where adults can relax and create art." Here, you can learn everything from the basics of handling clay, to wheel throwing (where you use a potter's wheel to create bowls, vases, etc). There's even a glazing technique class for advanced students. If you're interested in having a party here, that can be arranged, too. 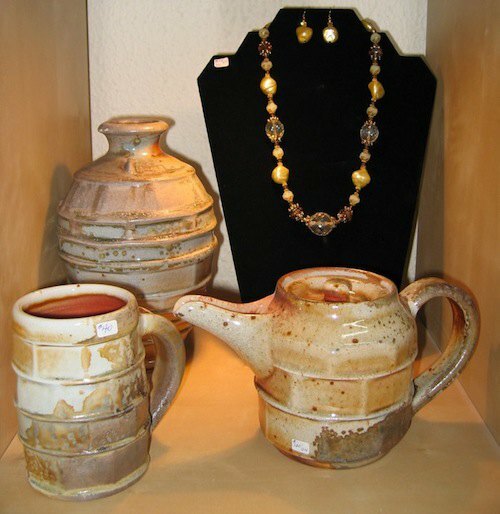 In December of each year they usually have a holiday sale, were they sell made by local ceramic artists, so keep an eye out for that. Billed as "the only training facility in the New York area where the circus stars come to train and teach," Circus Warehouse is the place in LIC where even the non-professional, "athletically inclined public" can learn circus performer techniques recreationally. These workouts can be intense in the best way. Take a class on the trapeze (flying and static), lyra (hoop), acrobatics, and ballet barre, among others. They also offer private lessons. You can pay for your time at Circus Warehouse by class, workout, or sessions, and these can be purchased as one-offs or as multiple workouts. More extensive information about their workout policies can be found here. 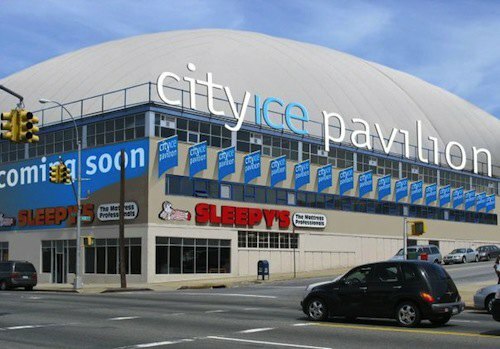 This is the city's only rooftop ice rink; they do have sister skating rinks in both Flushing and the Bronx. The rink itself is NHL-size and is open all year - covered in weatherproof dome - for hockey, figure skating, and skating parties for all ages. They also have summer and winter skating camps for kids. There are also public sessions scheduled, meaning anyone can come by and skate. Their overall programming schedule is on their calendar. Skate rental is $5 per person; helmets are $2 per person. Admission is $5 Monday through Friday, $8 Saturday and Sunday, and $8 Holidays, including all school vacation weeks. This park is on the LIC waterfront, starting from 50th Avenue at its southern edge and stretching approximately five blocks north; the northern part of the park is still closed (under construction) but when it opens, the park will be about 40 acres in size. At the park there are walking paths, places to lounge on prefab furniture, grassy areas including manicured gardens, picnic tables, a fishing pier, handball and basketball courts, and a playground. In the summer time, the concert series "Live at the Gantries" takes place, offering free concerts right on the water. 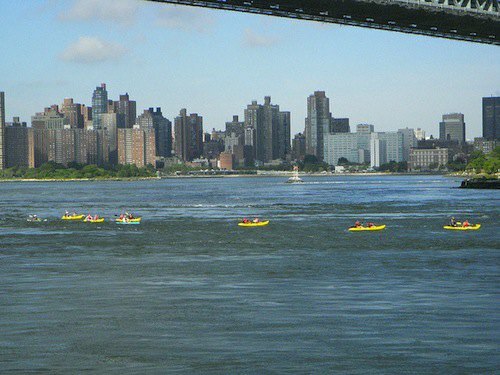 This organization encourages kayaking on the East River. It is an all-volunteer group who believes in the power of this educational and recreational paddling program. The boathouse was organized originally as a way to help revitalize LIC while raising awareness of the natural health and beauty, and the ecology of this NY waterway. To further that mission, they organize weekday and weekend paddles on the East River - boats are provided. On Sundays they host "walk-up" paddles at Hallets Cove, just to the north of Socrates Sculpture Park (GMAP). They make an effort to "accommodate persons of different skill levels and physical capabilities" - beginners to advanced. Participating is free (though some "sweat equity" is welcome in exchange). This large open space used to be a dump - literally. 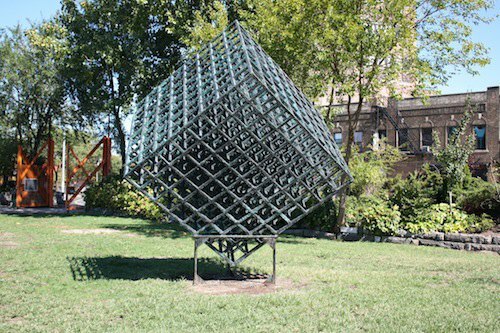 In 1986, a group of neighbors and artists, led by sculptor Mark di Suvero, combined their efforts and transformed the run down and grossly littered space into a public park. Large scale art works are displayed here, many of them come with the encouragement to walk in, on, or through them. Socrates also produces a international film festival in the summer, and is host to a greenmarket on the weekends from June to November, home to about a dozen vendors; cooking demonstrations are done on certain weekends at the market, too. The park also has beautiful waterfront views. The park is open every day from 10am to sunset and admission is free.